With a glut of Scandinavian crime fiction entering English translation it would be easy to overlook Pia Juul's The Murder of Halland. However, Juul is one of Denmark's most celebrated literary writers, and her foray into 'Scandi Crime' is a surprising subversion of the genre, rather than an attempt to jump on a bandwagon. 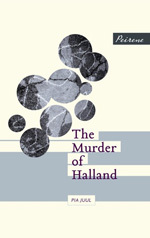 The subject of murder in a small Danish town may have aided the appearance of a first English translation for any of Juul's books, but The Murder of Halland is anything but another run-of-the-mill police procedural. The book opens with the shooting of a man called Halland on the streets of a quiet Danish town. His partner, Bess, is awakened by the gunshot, and initially the police suspect her of the crime, after a passer-by apparently hears Halland accuse her as he lays dying. It has all the elements of a classic whodunit. However, because we view the subsequent events through Bess' eyes, the police investigation fades into the background. Bess neither knows nor cares who shot her lover. Instead she wanders in a grief-induced fug, examining the effects that her affair with Halland and her alcoholism have had on her relationships, particularly with her estranged daughter Abbey. The police and her friends try to engage her in the mystery, but Bess retreats into introspection. For Juul, the interest in the crime lies not in its resolution, but rather in its effects on the victims left alive. The Murder of Halland is both playful and dark. As a portrait of a bereaved woman it is poignant, and Bess' apparent estrangement from the human race is beautifully played out. However, Juul finds time to lighten the load by repeatedly poking fun at the idea of a police procedural. The police, and occasional suspects, pop in to the narrative only to be dismissed with equal alacrity. It is as if Juul is daring the reader to care about the resolution of the case, when we really should be caring about Bess. Bess' disengagement, together with the unusual take on a crime novel, make this a strange, ethereal book, one haunted by the ghost of a narrative that the author repeatedly waves under your nose before whipping it away again. It is 'Scandi Crime', but not as we know it. The Murder of Halland is a memorable literary attempt to look at the real repercussions of violent crime, and a clever examination of the effects of grief on a lonely life.